There's a lot about Little to like. Not strictly a remake of Tom Hanks' 1988 classic Big so much as a reversal of the movie it was inspired by, Little is a sweet comedy with generous laughs, even if it doesn't quite come together in the end. But it has some charming performances, especially from Issa Rae whose naturally loose energy and style of humour automatically lifts anything she's involved with. 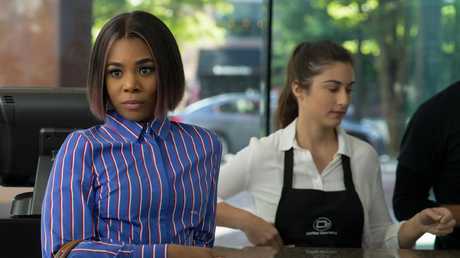 Jordan Sanders (Regina Hall) is a ruthless tech boss running a gaming company full of terrified employees. Sanders screams, demeans and makes Miranda Priestly look like a kindly fairy godmother. She's a workplace lawsuit waiting to happen. No one is safe from her bullying ways, including a young girl who had the temerity of being in her sights when Jordan's most recent temper tantrum culminates. That girl wishes Jordan would "be little" so people would "check her". 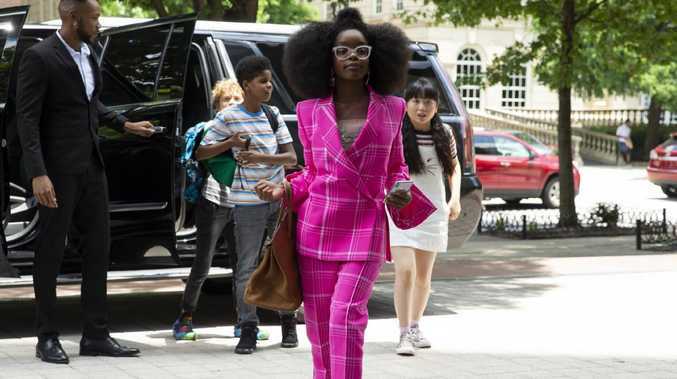 The next day, Jordan wakes up in her lush penthouse apartment and is stunned to find herself reverted to her 13-year-old self (Marsai Martin). With the reluctant help of her downtrodden assistant April (Rae), Jordan has to find a way to turn herself back to her adult body, but not before she's forced by child services to attend the same middle school she went to as a kid. There's a reason Jordan has become this particular version of her teenage self - an incident in her school-life, back when she was an idealistic kid, changed everything on how she viewed the world, sending her down the path of emotional detachment and success at all costs. As you would expect from a movie like Little, this magical journey is an opportunity for Jordan to learn. She may be stuck in a kid's body but she has the knowledge, perspective and financial resources of an adult, so it's a bit a do-over. Can you imagine having to go back to school again? But part of Jordan's emotional issues is arrested development - that she left a part of herself in that school auditorium as a bullied 13-year-old. Naturally, the whole adult-stuck-in-a-kid's-body idea lends itself to a lot of physical comedy and Martin and Rae look like they're having a ball sparring as equals but with the jarring visuals of their mismatched physicality. Watching Martin - best known for playing the very smart and scary Diane in sitcom Black-ish - behave like the acid-tongued Jordan we met as an adult is fun at the start, like the awkward humour of her making googly eyes at her hot teacher Garry Marshall (played by Justin Hartley and presumably named after the famed filmmaker and Big director Penny Marshall's brother). But the rushed arc of her character growth means you increasingly start to see little Jordan as a teenage girl and not as the 38-year-old woman she's supposed to be. Little is wholly predictable, but maybe there's something comforting in knowing exactly where each story turn is going. Little isn't a movie that's trying to challenge you with its plotting, it's more of a showcase for talented African-American women who are central both on screen and behind the scenes - though the performances tend to be much better than the movie itself. Written and directed by Tina Gordon, with 14-year-old Martin credited as an executive producer (Little was her idea), Little works in some ways and not so much in others. There are many sequences that are funny and winsome on their own, but as a movie, it doesn't cohere. There's no real flow from one set-piece to the next and it starts to drag, ultimately feeling much longer than its 109 minutes running time. Little is in cinemas now.